Dedicated PC software TrendCOM for data acquisition and analysis, automatic generation of test reports, export capability to external spreadsheets (MS Excel, Openoffice Calc, etc...). Electronic polarity reversal and anti-arcing protection (without fuses). 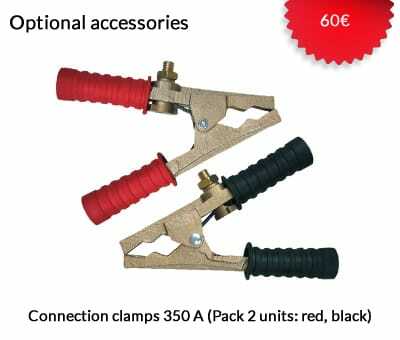 An active circuit prevents any arcing between the connectors when the battery is being connected. If a battery is connected with reverse polarity, the Battery Discharger doesn't start and no current flows. Auto-Test at power-on. When the Battery Discharger is powered, an automatic test of the control logic and power electronics is performed in less than 10 seconds. In case of components failures, the Battery Discharger remains in a safe, stand-by mode. Integrated DataLogger. 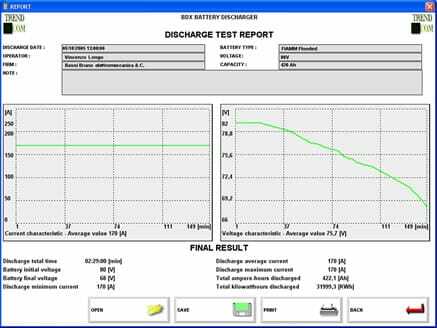 While the discharge is in progress, it's not necessary to leave a PC always connected to the Battery Discharger, because the integrated DataLogger has enough memory to save the entire discharge curve. 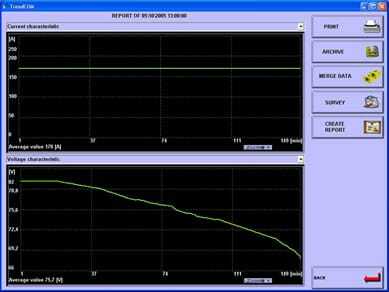 At the end of the test, it's possible to download the data from the Battery Discharger to the PC in seconds. The standard connection interfaces are serial (RS-232) and USB. Wireless interfaces are available on request. Unlimited parallel operation, managed by software. When two or more Battery Discharger units operate in parallel, it's possible to download all the data to TrendCOM, and to merge them into a single, complete test report. This feature gives the opportunity to achieve an unlimited discharge power, by connecting an unlimited number of Battery Discharger units in parallel. 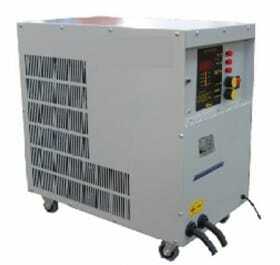 Temperature protection of all the power components and resistor bank. In case of internal overtemperature (e.g. 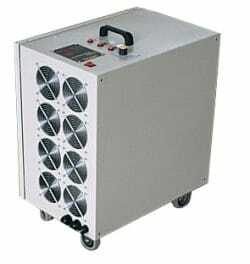 : blocked fans, air passages obstructed) the discharger is set automatically in stand-by mode. Double cabinet, for maximum thermal insulation. During the operation, the external parts of the cabinet remain cold (max temperature rise is 10°C), for maximum safety for the user. Heavy duty metal wheels, with ball bearings, covered with rubber. The Battery Discharger can be moved easily and safely on any floor, and can operate without problems in any industrial environment. 2 mm steel. Four wheels kit for easy moving. RAL7032. Three buttons (SET, + , -) for programming and control. Two potentiometers for current regulation (Coarse – Fine regulation). RS-232, USB Interface PC software (TrendCOM) for data acquisition, analysis and printing.